Arrive at Dubai international airport. Check inn to the hotel and evening free at leisure. Overnight at the hotel. After breakfast , depart for “Half day city tour” the journey begins from the historical part of the dubai with the guided tour of the city, which ends at modern Dubai. Later in evening enjoy the dinner while on Dhow cruise. It gives you a chance to a fantastic all round experience. Dinner on cruise and Overnight at hotel. After breakfast morning free at leisure. Afternoon depart for the “ Desert Safari Tour”. Full of fun and adventure and excitement, where you experience the thrill of a roller coaster ride on the sand dunes. Dinner at desert and Overnight at hotel. After breakfast morning free at leisure. 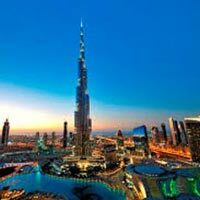 In evening will visit the largest shopping mall of Asia – “Dubai Mall” and “Burj Khalifa”, the tallest building in the world – from the observatory deck @ 124th floor, and musical fountain show – largest fountain in the world. Overnight at the hotel. Morning after breakfast, depart to visit the capital city of U.A.E – “Abu Dhabi”. During your tour you will visit the Sheikh Zyed Grand Mosque, which is probably the most imposing religious and national landmark in Abu Dhabi to date. Later will visit the world largest indoor theme park Ferrari Park. Here you will enjoy 20 rides. Evening you will be back to Dubai. Overnight at the hotel.